Kate Sitzman is now doing the dyeing at Woolgatherings and her handdyed spinning fibers and yarns are available in her Etsy Shop, at Northwest Wools in Portland, Village Yarn and Tea in Seattle, and at various fiber shows. There may occasionally be fibers dyed by Sandy, the "twisted Mom" of"The Twisted Sisters Sock Workbook", though she really is trying hard to be retired. Kate has opened her Etsy Shop and it is stocked with her fabulous handdyed fibers and yarns! you best hurry on over there... no telling how long they will last! Kate took a huge bunch of lovely newly dyed fibers to Northwest Wools today. Included are BFL, superwash BFL and Merino/Tencel. If you can, buzz on over there.. you won't be disappointed! 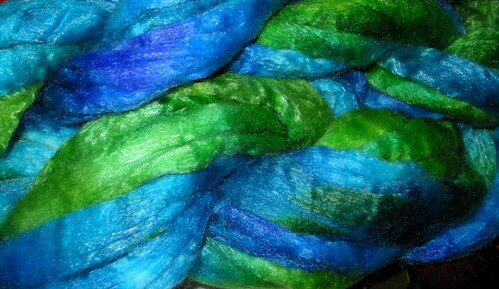 Handdyed spinning fibers and yarns will be available again from Woolgatherings!! Most of the dyeing will be done by Kate Sitzman, whose fibers you see here, and occasionally there will be handdyed fibers from the twisted mom, Sandy. Kate has a wonderful and artistic eye for color, and takes great care with her work. There are some spinning fibers for sale now atNorthwest Wools. Check back here for more information on the availability of handdyed BlueFace Leicester, Merino/Tencel, Merino/Silk and many other types of fibers! Thanks so much for your past support and purchases. 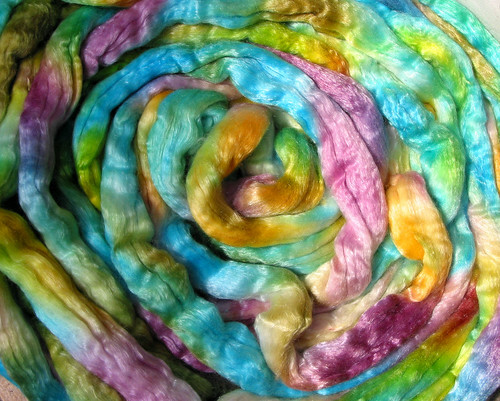 I know you will love Kate's dyed fibers, too!! You can contact her at woolgatherings at sitzman.net, and when her Etsy store is up and running, I'll post that information, too! there are no fibers for sale available at this time. Please check back again and if you are at the Black Sheep Gathering in Eugene, OR, June 21, 22, 23, be sure to look for the Woolgatherings booth. I will be sharing space with Lynne Vogel and Lori Lawson. 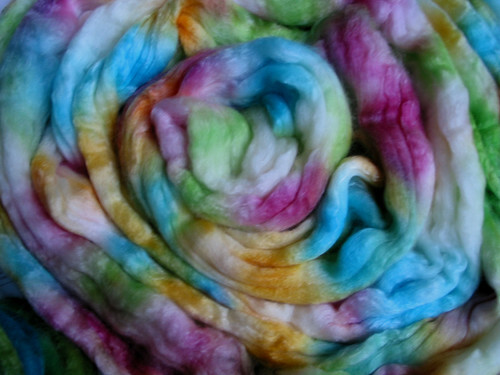 We will have an awesome array of handdyed fibers and yarns!! These are one of a kind color combinations, and cannot be exactly duplicated, though more could be dyed in similar colors. Superwash merino/tencel (70/30). My most popular color combination - "Crayons". 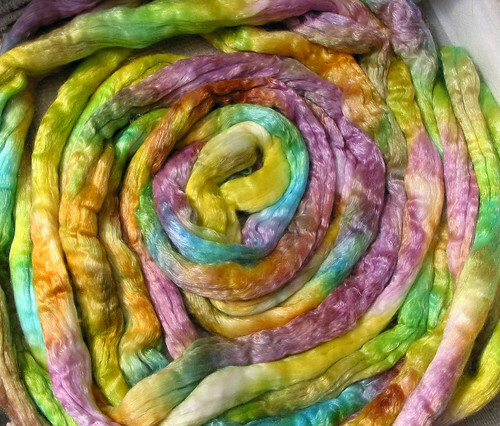 The dye is poured on the fiber - lime, yellow, orange, scarlet, magenta, iris. The photo shows blue, but it isn't really blue... more lavendar-purple-iris. I knit, spin, dye fiber, quilt, garden, live in the pacific northwest and love it all. whenever i have the opportunity, i enable others in all things fibery. as often as possible i spend time in a small village in the rugged hills of Crete, Greece and enjoy being with friends there (some of whom have become like family)... and enjoy the local wine and raki. and i always love coming home to my queendom and our sweet dogs, Meika and Tasha... a siberian husky and a mix of husky and who knows.